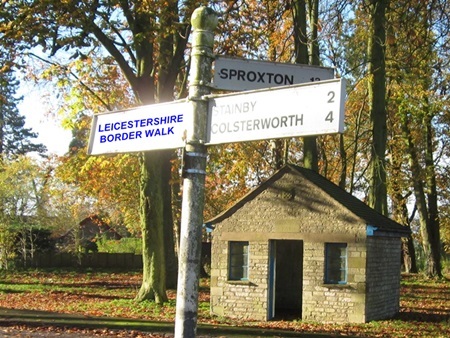 Although this is section one of the Leicestershire Border Walk there is no necessity to start here. Personally I did desire to make the circuit of the county a contiguous walk but as noted by these reports I started on section four at Castle Donington and walked anti-clockwise. Because there is no written route instructions you could easily reverse the direction and start anywhere. 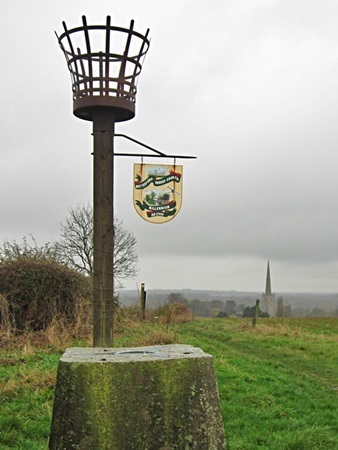 Looking at Leicestershire from the city of Leicester, Bottesford is perhaps the most isolated settlement within the boundary. 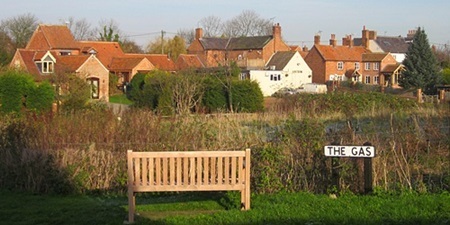 As the crow flies Bottesford is 25 miles from Leicester with no direct link by road or rail to the city. Logistically this may well be the most difficult to reach. There is however a two bus link between the start and end using services 19 and 24 changing at Melton. 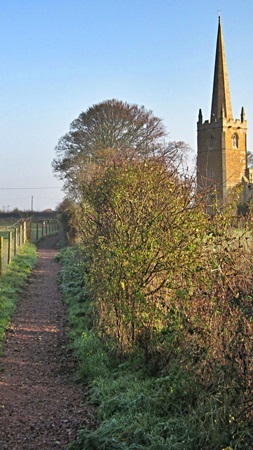 The walks starts along Barkestone Lane which the maps shows as a direct connection between the two villages but not a route for motor traffic. Taking a path across the fields brings us to Redmile where at the time of writing the once prosperous Peacock Inn is awaiting some TLC. From Redmile to Hose the walk could have used the towpath of the canal. We stay on the field paths but this parallel path offers you the opportunity to make circular walks. The villages come thick and fast along this section and all have some services but check opening times if you plan a visit. Dove Cottage Hospice also offers a tea room alongside the canal at Stathern Lodge. Finally there is the bus threading its way along the narrow roads offering you the opportunity to split this section or create short linear walks, no wonder the Vale of Belvoir is already a popular walking destination. Long Clawson lives up to the name being a straggling settlement hugging the road that famously has twelve sharp bends serving to calm traffic speed. Another tea shop in the centre opposite the doctors surgery and pleasant protected paddocks cheek by jowl to the constant pressure for more housing. At West End Long Clawson Dairy has been making Stilton cheese since 1911, when production moved from farm to factory. There have been casualties along the way as will be seen at Nether Broughton but Peak District ramblers will be aware of the derelict shell at Hartington and a modern cheese factory at Harby has stood abandoned for many years. The cold war still simmers with producers at Stilton in Cambridgeshire peeved that they can’t use the name. After a mile the walk leaves Long Clawson and climbs Slyborough Hill from which there should be decent views, but not for me as the day retained a stubborn mist. These fields appear to have been abandoned to nature and have become rough untended pasture. 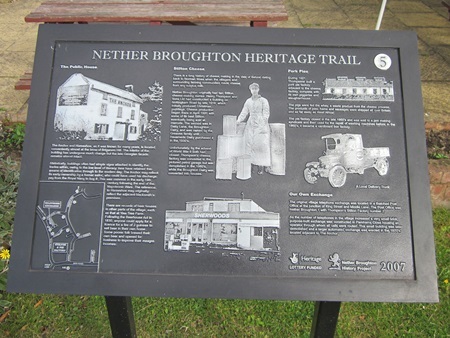 Nether Broughton offers a series of information boards around the village for which you might like to detour and locate. The one in front of the Anchor Inn tells us of the many small producers of Stilton which like most activities have been consolidated to large factory units. The trend with beer is currently the opposite and just off route at Old Dalby, Queensway, is Belvoir Brewery one of the many micro breweries that have appeared in recent years. 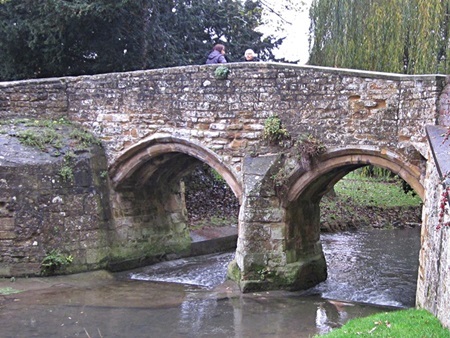 Nether and Upper Broughtons share a name but are divided by county and the Dalby Brook crossed on a plank bridge between the two villages marks our first crossing into Nottinghamshire. This walk can be based on Melton Mowbray by taking the 9.45 bus 55 towards Grantham which will drop you just fifteen minutes later in Buckminster. There is a service back from Bottesford but check on times. Or a safe leisurely option, start in Bottesford take the 08.30 bus into Melton and walk back to your car. I left the bus shelter passing the shop which once supplied petrol and post office services but manages to stay busy attracting locals for their daily papers. Walking along the main street the modern village hall has replaced a tin shed left over from the 1914-18 war. 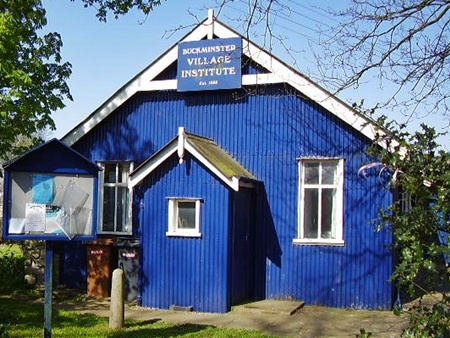 Alongside is the prosperous ‘Buckminster Yard’, former farm buildings converted to offer employment from modern businesses. Hopefully this site now provides additional custom to the Tollemache Arms opposite. The massive brick water tower is a landmark within another attractive block of buildings. Opposite is the start of the Mowbray Way along the tree lined road leading to the church and family mausoleum. The wall on our left marks the grounds of Buckminster Hall built in 1798 and demolished around 1950. The present house, which can be glimpsed through the gates, was built after the demolition. Good views north across the fields are to be enjoyed, confident of safe footing while still on the tarmac. The final piece of road is avoided by a cross field path which showed signs of reinstatement so should be useable even with a mature crop. Another water tower stands here obscured or screened by the trees depending on your opinion of this modern concrete structure. I should have said sooner that this walk is again remote. Sewstern Lane or The Drift is an ancient track used long before the linking of towns to form the Great North Road. While travelling humans needs the services offered by the coaching inns of towns such as Grantham and Stamford, animals driven to market along this parallel track needed only the grass on the verge for their overnight sustenance. It is said that at one road crossing stood the Three Queens Inn offering refreshment to the Drovers. Today there are no services until we reach Woolsthorpe. Ramblers and footpaths have finally been accepted by most landowners so after years of campaigning for walkers rights I struggle to oppose those who use routes with higher status. Heavy use by horses can soon turn a bridleway into a quagmire and speeding cyclists often surprise unwary walkers but if the route allows passage of motorised vehicles should we oppose them? It is unfortunate that many motorised users of green lanes appear primarily to enjoy the mud and challenge of ruts which too often destroys the surface for all other users. It’s hardly surprising that the authorities take steps to discourage this abuse to the detriment of any sympathetic motorised use. The welcome board at Buckminster Gliding Club could well be inviting those mud loving off roaders when it offers “Passion Freedom Fun” but only for those with a head for heights. When the Viking Way long distance route was created there appeared to be a gap in the highway across the airfield. The curving footpath we use today was created in 1997 to fill the gap but it’s only a footpath so no horses, no bikes, no motorised vehicles. The ancient Drift road has been lost or has it? Saltby airfield was built in 1941 and derequisitioned in 1955. Emergency powers were in place to temporally stop up highways for the war effort but all temporary closures were lifted on 31st December 1958 unless steps were in hand for permanent closure. With no permanent closure the Drift should now be available along the old line, but it’s not. If you want to know why, ask Lincolnshire County Council. North of the airfield serious action has been taken to prevent motorised abuse. Tank traps prevent access which is legally controlled by a Traffic Regulation Order. 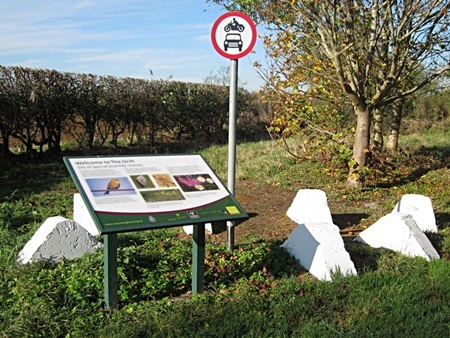 The wide highway is managed by the Wildlife Trust and they have certainly improved it for walking. A scheme to improve the grass land involves taking off the hay each summer and this has been left on site in the form of miniature round bales. Two things happened while I walked this pleasant stretch. One is fairly common the other very uncommon. A dog walker approached from the opposite direction and one dog suddenly makes a barking bee line for me. The owner attempts to call it to heel but as is often the case the dog ignores the calls. I stand still and the dog becomes more aggressive. Finally the owner is able to get a leash on and I can relax. What was most unusual was the owner accepting full responsibility for the incident and apologising. After crossing the Melton to Grantham road there are views to the east of sprawling Grantham centred around the impressive tower and spire of St Wulfrums church. 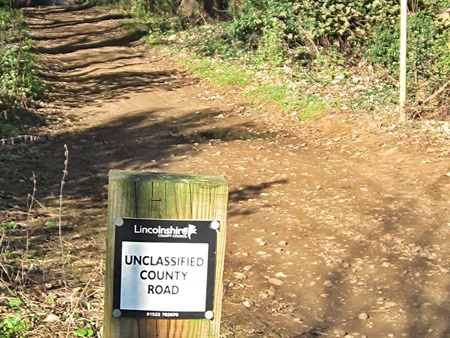 I’m now back on a track where motorised vehicles are tolerated and later even accepted with a small sign stating ‘Unclassified County Road’. I’m not really an animal person, as the dog incident may suggest but when I see a small bird attempting to escape from a tangle around its leg and a twig I go to the rescue. It looked like sheep’s wool which to a small bird was the equivalent of heavy rope for a human. I decided to amend the route and head directly for the Grantham canal, no need to tick off Woolsthorpe by Belvoir as it’s in Lincolnshire. This route still takes us past a potential refreshment stop at the Rutland Arms. For forty three years this inn, know as The Dirty Duck, has prospered with Bob Taylor at the helm but after the 2014 annual bonfire party at the age of 74 he was calling it a day. Some say it was retirement others say the Belvoir Estate wanted him out. 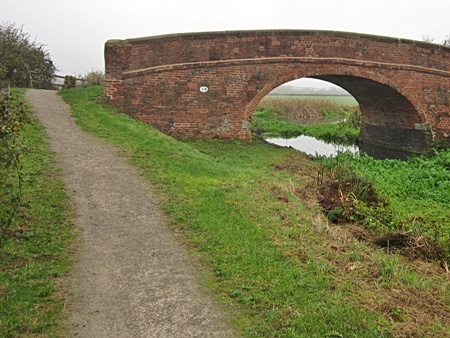 Leaving the easy walking of the canal towpath at the traditional brick ‘Longore Bridge’ number 58 the path takes me across Muston Meadow one of the finest lowland meadows left in England, so tread carefully please. 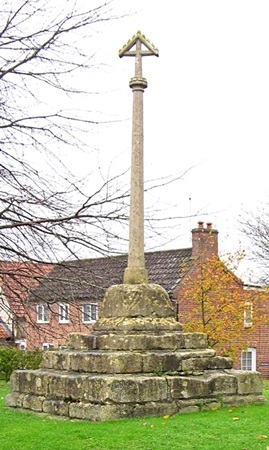 Turning right by the 14th century cross the path crosses the River Devon (de-von) and emerges by the church and Old Forge Tea Rooms. Bottesford is not far away but to follow the border and add another village I cross the A52 then the Nottingham to Grantham rail line. There is an application to close this level pedestrian crossing but it won’t be lost without a fight. The next section is again remote although the distant drone of traffic on the A1 is ever present. There had been more rain on the heavy clay soil so I was relieved that the paths here were on wide grass headlands keeping my boots free of cloying mud. The spire of Bottesford church visible as if standing alone atop the hill, not part of the hidden building beyond. As I approach Normanton to the north is another former airfield site. Now an industrial estate but the concrete roadways are used to store cars and vans as far as the eye can see. This is the most northerly village in Leicestershire. A straggling satellite of Bottesford, it is also the furthest point North on the walk. A fitting finale is the climb over Beacon Hill before passing St Mary’s church and passing over Flemings bridge leading to Church Street and walks end. If you have not been to Bottesford before then a look inside the church is recommended to see the impressive memorials to the Earls of Rutland. I thought there was little to see along this final section but I appear to have written more than usual. While there was little to attract my attention I had time to think, a pleasure or curse of walking alone.